Anthurium is a genus of about 1000 species of flowering plants, the largest genus of the arum family, Araceae. General common names include anthurium, tailflower, flamingo flower, and laceleaf. The genus is native to the Americas, where it is distributed from northern Mexico to northern Argentina and parts of the Caribbean. Common Names Anthurium, Tailflower, Flamingo flower and Laceleaf Scientific name: Anthurium andraeanum Watering: Less, once in two days or three days. Place to Keep: Indoor, in shade. Anthuriums are one of the most popular tropical flowers with a long vase life of about six weeks and even more depending on the variety and season. The red, heart-shaped flower of Anthuriums is really a spathe or a waxy, modified leaf flaring out from the base of a fleshy spike (spadix) where the tiny real flowers grow. The anthurium flowers appear as a roughness on the spadix as compared to a smooth spadix. Most common colors of anthuriums are red and shades of red. In Greek, the name Anthurium means tail flower. The plant's stem lengths may grow to a height of 15-20 inches depending on the size of the spathe, i.e., the bigger the spathe, the longer the stem. Its leaves are usually simple, large, attractively colored and borne on long stalks. The flowering stalk is slender, ending in a fleshy column crowded with many unisexual flowers. They have leafy bracts which may be white, yellow, red, pink, orange or green. Being popular foliage plants, Anthuriums are grown for their attractive flowering bracts which are popular with the cut flower trade. All parts of the anthurium plant, are poisonous. If ingested, may cause mild stomach disorders. The anthurium plant's sap can cause skin irritation. Growing Anthuriums Anthuriums can be grown by 4 methods. They are by vegetative reproduction, seeds, tissue culture, and fertilization. Anthuriums grow on a wide range of soil types ranging from sandy loams to heavy clays. Anthuriums need a highly organic soil with good water retention capability and good drainage. A well-drained soil is important to prevent the rotting of stems and roots. Anthuriums should be planted in raised beds of 1.3 to 2 meters wide and 20 cm deep. Anthuriums should not be planted more than 5 cm deep, as deep planting results in the rotting of stems and roots. Stake the anthurium after planting for support. Water the anthuriums immediately after planting. A layer of coconut husks, semi-rotted wood, or sugar cane bagasse may be used. Mulching is needed for the anthuriums plants. Anthurium plant roots grow into the mulch and spread. Anthuriums Plant Care Remove dead and unsightly foliage and faded or brown flowers. Use a peat moss base. Anthuriums need a high light but not direct sunlight. Water your anthurium thoroughly, but allow it to dry slightly between waterings. Do not over-water the anthuriums as it may cause root damage and yellowing of the leaves. Fertilize the anthurium plant about every other month. Avoid draughts and strong temperature fluctuations. In winter, anthurium plants need a 6 week rest period at a 15Â°C with little water. This allows the plant to flower profusely again in the following season. Anthurium is a genus of herbs often growing as epiphytes on other plants. Some are terrestrial. The leaves are often clustered and are variable in shape. The inflorescence bears small flowers which are perfect, containing male and female structures. The flowers are contained in dense spirals on the spadix. The spadix is often elongated into a spike shape, but it can be globe-shaped or club-shaped. Beneath the spadix is the spathe, a type of bract. This is variable in shape, as well, but it is lance-shaped in many species. It may extend out flat or in a curve. Sometimes it covers the spadix like a hood. The fruits develop from the flowers on the spadix. They are juicy berries varying in color, usually containing two seeds. The spadix and spathe are a main focus of Anthuirium breeders, who develop cultivars in bright colors and unique shapes. Anthurium scherzerianum and A. andraeanum, two of the most common taxa in cultivation, are the only species that grow bright red spathes. They have also been bred to produce spathes in many other colors and patterns. Like other aroids, many species of Anthurium can be grown as houseplants, or outdoors in mild climates in shady spots. They include forms such as A. crystallinum f peltifolium with its large, velvety, dark green leaves and silvery white venation. Many hybrids are derived from A. andreanum or A. scherzerianum because of their colorful spathes. They thrive in moist soils with high organic matter. In milder climates the plants can be grown in pots of soil. Indoors plants thrive at temperatures between 16°C-22°C (60°F-72°F) and at lower light than other house plants. Wiping the leaves off with water will remove any dust and insects. Plant in pots with good root systems will benefit from a weak fertilizer solution every other week. In the case of vining or climbing Anthuriums, the plants benefit from being provided with a totem to climb. plants nature is indoor & less watering. Offer- use coupon code GIFT300 to avail a discount of Rs 300/- off. Anthurium Anthurium is a genus of about 1000 species of flowering plants, the largest genus of the arum family, Araceae. General common names include anthurium, tailflower, flamingo flower, and laceleaf. The genus is native to the Americas, where it is distributed from northern Mexico to northern Argentina and parts of the Caribbean. Common Names Anthurium, Tailflower, Flamingo flower and Laceleaf Scientific name: Anthurium a..
Anthurium Anthurium is a genus of about 1000 species of flowering plants, the largest genus of the arum family, Araceae. General common names include anthurium, tailflower, flamingo flower, and laceleaf. The genus is native to the Americas, where it is distributed from northern Mexico to northern Argentina and parts of the Caribbean. 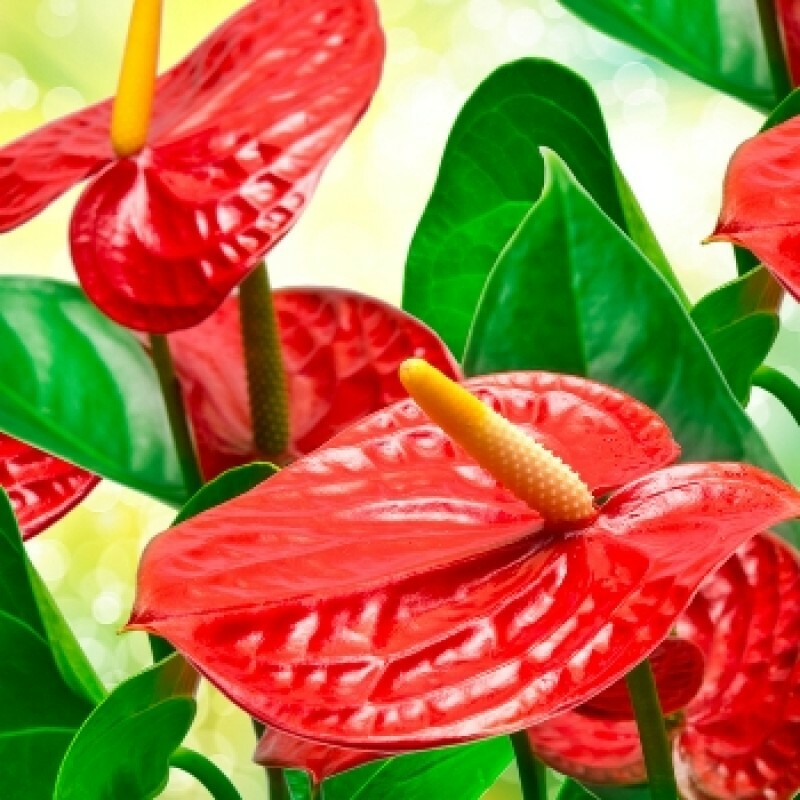 Common Names Anthurium, Tailflower, Flamingo flower and Laceleaf Scientific name: Anthurium andraeanum Watering: Less, once in two days or three days. Place to Ke..
Anthurium Anthurium is a genus of about 1000 species of flowering plants, the largest genus of the arum family, Araceae. General common names include anthurium, tailflower, flamingo flower, and laceleaf. The genus is native to the Americas, where it is distributed from northern Mexico to northern Argentina and parts of the Caribbean. Anthuriums are one of the most popular tropical flowers with a long vase life of about six weeks and even more depending on the variety and season. The red, heart..